The Zeiss Distagon T* 50mm f/1.4 ZF.2 Lens is a bright and compact standard lens with precise manual focusing with a large rotation angle for precise control. The Planar T* 50mm f/1.4 is designed for medium and longer distances and provides high-performance wide open, and improves as the lens is stopped down. The lens construction controls flare and ghosting artifacts, resulting in a brilliant image with excellent contrast and natural color rendition. 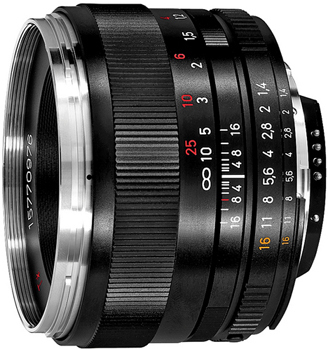 Combined with a DSLR with a 1.5 crop factor, the lens becomes a compact, lightweight 75mm portrait lens. The new ZF.2 lenses are an enhanced version of ZF lenses. They feature an electronic interface (CPU) that enables support of all important camera operating modes such as shutter priority, aperture priority and programmed auto exposure or manual exposure settings on non-AI compatible camera housings. Photographers no longer have to set the parameters in the camera menu as the lens now transmits standard data such as focal length, speed and the aperture setting to the camera. This data can then be viewed in the EXIF data of each picture. Furthermore, silver fork coupling is not available. For this reason, you cannot use light metering on older cameras (F, F2, Nikkormat, etc.). The ZF.2 lenses have a mechanical lock on the aperture ring to lock the aperture ring at the lowest setting and prevent unintentional adjustment while taking pictures.